Yahoo has long conceded to Google when it comes to search. Still, Yahoo is the second largest search engine in the world and a force to reckon with for all other search engines. So when Yahoo gave up the seat to computer based search to Google, they set their sights on mobile. The mobile market is pretty much an immature one compared to the saturated computer based web. Accessing data through cellular phones is still relatively new and the amount of data that can be processed in reasonable amounts of time is a lot smaller hence more lightweight than the usual web on a computer. So to explore greener pastures, Yahoo is refining its technology to gain some ground in the mobile market. 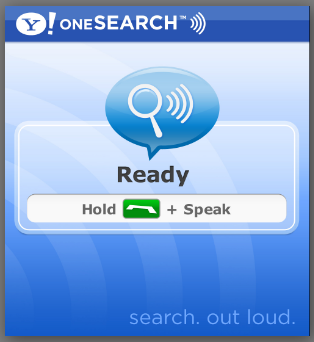 Sure, even Google has their search engine available on mobile phones, but Yahoo is going further than simple text based search and into a properly working voice search. Voice search is important since typing on a phone is always harder than typing on a regular keyboard. And although Google has their 411 voice -only search service, Yahoo’s convert your query from text to voice which in most cases a whole lot better. So what does this mean? From June 2007 to June 2008, "the number of people accessing mobile search at least once a week grew 50 percent in Europe, with France and Spain leading at a rate of 69 percent and 63 percent, respectively," according to ComScore analyst Alistair Hill, "and the number in the U.S. grew 104 percent to 10 million. But Google leads Yahoo by a wide margin for mobile search usage in the U.S., U.K., Italy, France, Spain, and Germany." In a nutshell, Yahoo is making a solid stance on a new market, just as they did with the web nearly 15 years ago.